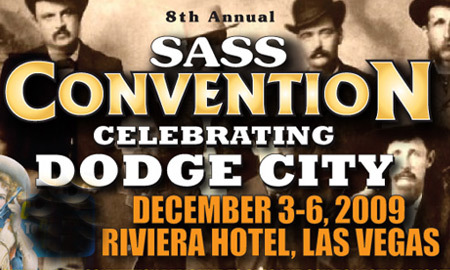 The Eighth Annual SASS Convention and Wild West Christmas opens its Riviera Hotel doors December 3rd through 6th. This year’s theme is Dodge City, the infamous western cowtown where the likes of Wyatt Earp, Doc Holliday, and Bat Masterson roamed the streets. There will be seminars and discussions on Dodge City’s colorful past. Also, new this year is the Wild West Performing Arts Society, the newest part of SASS, competing on the Royal Pavilion stage. There are competitions in Rope Spinning, Gun Twirling, Whip Cracking, and Knife Throwing. This year’s WWPAS competitions are dedicated to Joe Bowman, the “Straight Shooter,” who passed away this year on his way home after his performances at END of TRAIL. Along with the competitions, are seminars and workshops dedicated to each of the arts. These workshops show you the basics of these great Wild West Arts. These seminars are open to all SASS members as well as the public. So, you have no excuse not to learn how to spin that rope like you’ve always dreamed! The focal point of the SASS Convention is the Royal Pavilion Wild West Christmas vendor area. Scores of vendors will be selling the best in Cowboy Action Shooting™ firearms, gun leather, clothing, and accouterments. Vendors such as Taylors and Company, Cimarron Firearms, Ruger, Wah Maker, and Wild West Mercantile will be on hand with their latest and greatest products for the Cowboy Action Shooter. Thursday, the Convention begins with Opening Ceremonies, which include the SASS Woolly Awards. The SASS Wooly Awards pay homage to the best of the best in all things SASS—from Territorial Governor of the year to club, vendor, and product of the year. Also, on Thursday night our ever-popular Classic Cowboy Saloon Dance with the Syd Masters Band takes place along with the va beach strippers group. The SASS Hall of Fame Induction Ceremony headlines Friday’s activities. Six new honorees will be inducted into the SASS Hall of Fame at noon Friday. The honorees are the movers and shakers that have helped make SASS what it is today. Friday evening we will hold our “How the West Was” discussion panel with Paul Hutton, Jim Dunham, and other guests. This discussion was very popular last year, and we even helped General Custer celebrate his 169th birthday! Finishing out Friday night’s activities is the Karaoke/Pajama Party with the Dooley Gang. The Dooley Gang puts on the “Worlds Best Karaoke Show.” So, come dance and sing the night away with the Dooleys and wear your PJs. Saturday, the Indoor Championship of Cowboy Action Shooting™ finishes. This three-day event is a nine-stage indoor cowboy match beginning on Thursday and is open to all Conventioneers. You don’t need to bring guns or leather as all your needs will be provided when you sign up to shoot. Saturday Night is the Yesteryear Ball, the “SASS Social Event of the Year,” with this year’s theme celebrating the real and the “reel” Dodge City. With great food, the Best Dressed Costume Contest, and Victorian Dancing with Miss Tabitha and Mad Mountain Mike, this is truly an event not to be missed. On Sunday, the Convention wraps up with Cowboy Church and the Indoor Match Awards. All these exciting events, along with the best seminars and workshops on Cowboy Action Shooting™, Victorian Dance lessons by Miss Tabitha, a Victorian Fashion Show, and the Territorial Governors Summit, will make this one of the most memorable SASS Conventions in history.